My friend died 12 years ago. My cervix cells may well be rotting again, won't find out until mid-October. Morbid. Iris, who bakes, had a cleaning frenzy today. I'm carefully as enthusiastic as if she were a son. Forgive me presuming on so very slight an acquaintance; after Mr. Fink-Nottle and I left the club last night he happened to mention your experience with the super-natural. I understand that you're terribly busy, but I was hoping you might be able to drop me a line of advice. You see, I'm afraid I may have an un-dead aunt. I was at a house party last week at my Uncle Herbert and Aunt Margravine's place in Nottinghamshire and, unable to sleep after a very fine steak tartare and an unfortunate conversation, about two a.m. I went for a walk around the grounds. My ambulations took me past a little romanesque folly and in it I thought there might be two figures under but the one cloak. Due to the nature of the afore-mentioned unfortunate conversation, I did not pause to investigate or engage them in any "in such a night as this"-ing, but hurried to the bridge, where I proceeded to contemplate the sleeping ducks for some time. Upon my return to the house, I found, my aunt's shoes and opera cloak outside her room ready for cleaning, and I must say they rather needed it. They gave the appearance of having been worn when wading in to stop over-zealous hounds from further damaging a rather fine fox skin. My aunt herself only appeared at the cocktail hour, looking pale and interesting as is her wont. Neither of these occurrences would have raised my suspicions alone if I had not also noticed that the giant convex mirrors that used to face each other at either end of the blue sitting room have been replaced by Egyptian statuary. I'm writing to you because I'm simply not sure how to continue. Learning ultimate from Sokis and his Monkey Surfers: Play hard, have fun, smile and every so often do a silly dance. Short spherical woman in padded silver jacket and boots bobbed into cafe. Suddenly on a space station, latte v. convincing. Today I am thinking of absent friends. Gillian's at the lake with Dave, dogs and a whole lot of work. She developed this recipe. You can make it for me instead of answering the questions I asked if you like. 1. Use actual butter: salted is good, unsalted traditional. 2. Use actual honey made by bees. Don't mess with anything else. 1. Good Sturdy Base: in greased (with butter) Big Flat Oven Tin lay down 10 layers of buttered filo (melt butter and paint on with a pastry brush). You're probably going to need most of a pound of butter by the end I suppose, but I've forgotten. 750g Walnuts, finely ground, if you can be bothered toasting them it's extra nice. Or pistachio or hazel nuts (not blanched). 3. Take 1/2 mixture and spread thickly over the 10 layers. 4. Put down another bunch of layers of filo and butter, maybe 6. 5. Put other 1/2 mixture. 6. Put down another 6 layers finishing with butter. 7. Cut into longish diamonds, cut into but not through the bottom layers. 8. Bake at 200* C for 15 minutes. Or until a beautiful light golden brown. 9. While still scorching hot pour over a good amount (1.5 cups) of melted honey. 10. Let cool to allow honey seepage. 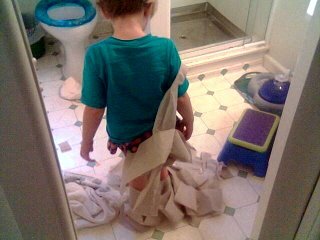 "... and I put my bandanna in your bed so you could wear it at night. And you said 'Thank you' and pretended to be Michael the Pirate Prince all the nights." Pop Quiz. 1. What should I be saying about you and to whom? 2. What am I learning from you? 4. Limerick or haiku? Please provide example. 6. What is it that you like about your favourite antihero? 7. What should you ride in my mind? E.g. Steed, Dragon, Dragonfly, Bike. 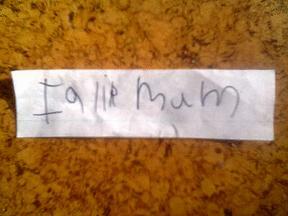 Found a piece of paper, it says 'I like Mum'. Just enrolled in my last Playcentre course 3 thing. It clashes with the Ultimate Indoor Nationals. Iris has made me an imaginary birthday cake with slices so huge we have to plunge into them with our mouths open. Today in Thorndon I saw two men in suits, one towing a wheeled cabin baggage, smile, wave at each other and hurry toward each other. They shared a blokey hug with back slapping, laughed, and snogged. They walked off hand in hand in the spring sunshine. Test: Maple syrup, tissues, onions, sausages, buns. Rolled oats, dried fruit. Cheese. Ginger beer. Cottage cheese. Eggs.